Most of the Inkies write some sort of inspirational romance. Many of us have tried our hands at inspirational historical romance. However, the inspirational historical romantic suspense novel is not for the faint of heart, and few of us have endeavored to undertake it. In Redeeming the Rogue, C.J. Chase perfects a balancing act of epic portions, keeping all the plates spinning throughout a story that will leave you breathless. Writing any novel is a balancing act. Balancing plot, character, dialogue, and description in a way that will draw the reader into the fictional world is quite a feat to begin with. Choosing your point of view characters and who will get which scene requires still more balancing finesse. You must pace your story so that it never grows boring but does not leave your reader feeling rushed or confused. Now combine all of this with good writing style, artistic elements, grammar, and spelling. In fact, in my new role as acquisitions editor for WhiteFire publishing, I’ve noticed that it is this perfect balance that is the final step to becoming a writer worthy of publication. There are many writers out there who are close, but it’s not until you develop this finesse that a publisher will take a risk on you. Many writers can conquer the essay, the short story, even the nonfiction book. However few demonstrate the tenacity and maturity to pull off an entire novel. Now consider that C.J. has done all of this while also balancing the elements of four genres. As an inspirational novel, all of her main characters must have a faith journey. As a historical novel, she must set the story in history and provide her readers with the rich details and setting that will allow them to travel to this time period. As a romance, she must give a full story arc for both hero and heroine, plotting both an inner and outer journey for each of them that will all perfectly dovetail into an explosive climax. And if all that were not enough…C.J. adds an entire suspense plot full of action, intrigue, and excitement. Are you getting my point? This is no small feat! I personally have managed to write an inspirational historical romance, but it took me 125,000 words. C.J. pulls off this inspirational historical romantic suspense novel in around 75,000 words, and honestly, even after reading it, I have no idea how she managed that. Let’s take a quick peek at each element. Inspirational – The story provides a wonderful faith journey for both hero and heroine who similarly struggle with forgiveness, the heroine with forgiving others and the hero with forgiving himself. The hero faces an added struggle with alcohol as he attempts to drown the memories of his failures. How can the heroine ever trust him when her own childhood was destroyed by an alcoholic father? Historical – The novel plays out against a wonderful background of the British Navy shortly after the war of 1812. It offers a sweeping view through the grand Regency parlor life that romance fans love, to middle class existence, and the harsh realities of poverty in London. An adorable Oliver Twist sort of character tops off the story just right. Romantic – Of course the story supplies a heaping helping of romance in a wonderful rich boy/poor girl sort of motif with plenty of tension and seemingly insurmountable conflicts. Suspense – Murder, political intrigue, and spies provide the glue that holds the whole story together. The heroine’s American brother has disappeared while impressed aboard a British naval ship. She is determined to get to the bottom of the situation and seek revenge if needed. Meanwhile, the hero hides from the consequences of his own life of espionage. Needless to say, there is never a dull moment in Redeeming the Rogue. And yet the story never feels rushed or confusing. Bravo C.J.! You’ve done a fabulous job. I look forward to many more books by you in the future. What sort of genre mixes do you enjoy in a book? 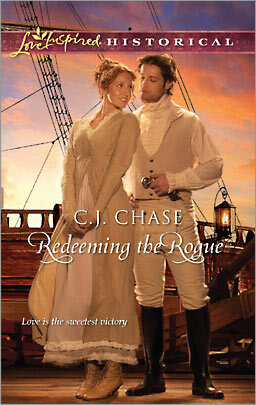 Have you read an inspirational historical romantic suspense before? Did the author do a good job at balancing the elements? If you are a writer, which elements do you find hardest to balance in a novel? I would love a chance to win a copy. Thank you! We all knew the vampire Amish novel had to be coming. LOL. I'm still in Florida everyone. Going to the waterpark today, but I'll be back later on. Amber, I think you'll really enjoy Redeeming the Rogue if you buy it -or win it! Thanks for leaving a comment. I couldn't agree more, Dina. This is probably my favorite of all the Love Inspired Historicals I've read. I love a meaty plot and she's got one with great intrigue. And - without sacrificing the characters and love story. Enjoy the water park Dina! Every time I read another CJ post this week makes me more excited to read her book. The first time I became aware of suspense elements in a historical inspirational was while reading Legacy of Secrets by Sara Mitchell (Steeple Hill Love Inspired Historical #5). Although I didn't purposely seek out this combined genre afterwards, I enjoyed a small thrill whenever I saw another book of Sara's had been released. She doesn't bill them as suspense, but a glance at her titles and blurbs will prove they have that element. Or at least the ones which have drawn my attention. Great post, Dina. I'm wondering if there are enough of this genre to feature on a backlist month? Welcome, Amber. For several years writers have been joking about an Amish-vampire mash-up. I'm just glad when it finally came the author was Leanna Ellis. I've haven't read it yet, but I've been hearing lots of good "buzz" so I think i'm going to have to try it. Dina, just want to thank you for bringing a smile to my face this morning. Here all this time, I thought it took me so long to sell because I'm a slow learner. But see, I just had more to learn because I'm writing in 4 genres at once. Ha! People underestimate how hard combining all of those things in a book really are! To answer Dina's question, historical romantic suspense is a scarce commodity. When I started on my WIP, I tried to find stories in this category to see what the publishers were buying. I could find lots of romantic suspense -all of them contemporary. Historical romance- of course! In fact it's swung around to become wildly popular again (thankfully!) I kept asking and finally I'm starting to see a few. CJ's book is an excellent example. You really showed the depth of work that goes into this, Dina, and I hope readers find they want more more more! Faye! Our lurkers are losing out. You and Amber have a great chance to win CJ's book. I'm going to check tonight to see if it's in the store yet. CJ, that probably is the truth. I've noticed now a number of writers who are proficient in nonfiction and think they should be able to write a novel. Not by a long shot. I'd say they have less than half the skills needed. I personally haven't tried writing suspense yet. I'm not sure if I'd be any good at it. I don't read much suspense. I don't really like books that make me feel tense, but I didn't have that feeling with yours since the heroine was pretty much stirring up her own trouble and well aware of it. Great article. It is hard to get the right balance of all the elements in a novel. Faye, thanks. On top of putting everything together, I had to cut 7,000 words to fit into Love Inspired Historicals guidelines. I was scared to death I'd delete a thread early in the book, and then the whole thing would unravel like a sweater. Deb, I stopped at Walmart this afternoon, and they still had the old books up. But I've noticed our area doesn't stock until several days after the release date. Now on Amazon, I've sold 4 times as many Kindle editions as print. I guess few people are going to Amazon to buy the print versions any more. Dina, thank you for dissecting all of these elements. You summed them up wonderfully and I'm saving this list. I'm not sure if my review on Saturday will come close to what you've shared about CJ's book. You nailed all the important pieces. Oh, and I also thought of Oliver Twist. :) Have fun at that water park! I'm late to the party. My daughter is moving out this week, and my house is a little in disarray. I could have sworn I visited Inkwell yesterday. Great post, Dina. I guess this helps explain how CJ's book is so rich and full--and why there is so much there for everyone to enjoy.